Bellingara Welsh Stud is the proud home of Royal and All Welsh Multi Champion Trentlyn Benson. We also stand three more very promising young stallions - Bellingara Shogun, Creswell the Conqueror and Bellingara Nirvana. 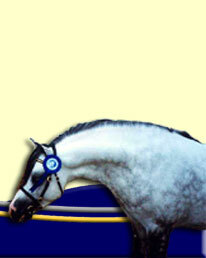 For more information on each pony stallion, please click on the links below. 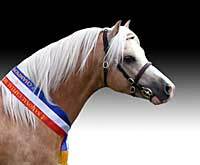 The Welsh Pony stallion Owendale Bart also stood at Bellingara Stud, until his recent death. We have a number of this stallion's progeny in our herd. For more information about Owendale Bart, please see below. Mare owners are welcome to come and view our stallions at stud. We realise it's important to see the stallions up close and personal, to not only assess their conformation and movement, but also their temperament. Bellingara Welsh stud also retains a number of progeny from each stallion, to keep as part of our breeding programme and show team. When you are choosing a stallion for your mare, don't forget to look at the stallion's offspring too! 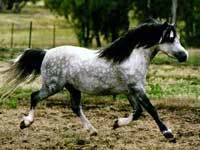 Seeing the ponies a stallion has thrown, will demonstrate the traits that particular sire throws, and what type of mares cross best with him. We are happy to discuss our pony stallions with mare owners, and help decide which stallion at stud is best for your mare. 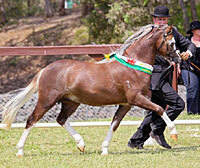 Welsh A Pony Stallion "Snowdon Vale Peter Pan"
Previously owned by Bellingara Stud, no longer standing.